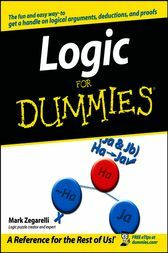 Logic For Dummies tracks an introductory logic course at the college level. Concrete, real-world examples help you understand each concept you encounter, while fully worked out proofs and fun logic problems encourage you students to apply what you’ve learned. Mark Zegarelli is a professional writer with degrees in both English and Math from Rutgers University. He has earned his living for many years writing vast quantities of logic puzzles, a hefty chunk of software documentation, and the occasional book or film review. Along the way, he217;s also paid a few bills doing housecleaning, decorative painting, and (for ten hours) retail sales. He likes writing best, though.